More Moon and more craters from January 17. For those that tune in here for the first time: my Moon photos are not taken through a telescope, only with a modest Canon Powershot SX1 at 20x zoom (560mm in 35mm terms). At 10mp resolution, this allows an image size of only about 600×600 pixels, but I still love to try it once in a while because it’s amazing how much detail you can pick up with such a relatively “little” camera. Each photo is made up of about 15-20 stacked frames combined with Registax to get rid of the camera noise and bring out more detail. 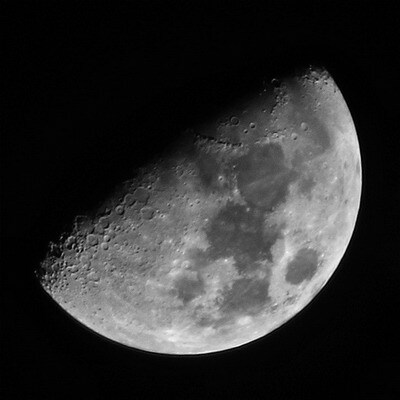 Final tweaking was done in Paint Shop Pro X with a bit of contrast and brightness balancing and a highpass filter in addition to Registax’ Wavelet sharpening. I wish I had a camera with an even more powerful zoom so I could get even closer, though!